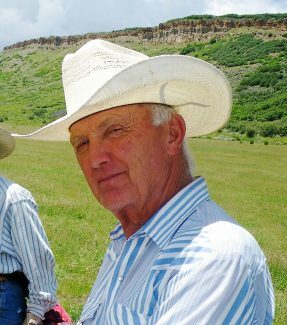 Jerry Leon Green, 76, passed away at his home in Hayden, Colo., on March 1, 2018, after losing his battle to cancer. He was born on July 5, 1941, in Hayden's Solandt Memorial Hospital to Mabel and Leon Green and joined his sister Sally on the ranch 18 miles south of town. Here they grew up roaming and riding the fields and hills of the East Williams Fork River Valley. Jerry attended first through sixth grades at the country schools of Dunstan and Beardsley, then finished his schooling in Hayden from 1953 to 1959. He went on to attend Colorado State University graduating in 1964 with a B.S. degree in general agriculture and obtaining his teaching certification in 1966. During his collegiate days, he competed on the CSU Rodeo Team and qualified for the National Intercollegiate Rodeo Association Finals twice. Jerry was a competitor. He began his roping career heeling the family dog and roping the chickens. He played rodeo using stick horses, announcing the rodeo as he timed and roped for each of his imaginary contestants. He joined the Rodeo Cowboys Association in 1962 and enjoyed competition in their sanctioned events. He met many friends throughout his college and professional careers and enjoyed maintaining those friendships. Jerry taught high school math and science at Pawnee High School in Grover, Colo., for 12 years beginning in 1967. Besides the academics, he coached one year of football and eight years of basketball. Several of his basketball squads were successful in making the district playoffs. Here he made lifelong friends of students and community. Jerry married Judy Herskind in 1969 and they enjoyed teaching, rodeoing and ranching together for 48 years. It is an understatement to say that Jerry loved ranching. He enjoyed calving time the best and maintained meticulous records of all the cows, hay production and weather events. In 1995, the family ranch received the Colorado Centennial Farm Certificate which recognizes those families who have owned their farm or ranch for 100 years. Jerry felt privileged to have been the fourth generation to operate the ranch. In October 2016, Jerry was presented with Routt County's Leckenby Award for "Enriching the Quality of Life in Routt County by Significantly Contributing to the County's Cultural Heritage." Jerry was recognized for his 20-plus years of serving on the Hayden Heritage Center's board of directors and his devotion to recording the history of west Routt County by helping to publish two history books. Jerry is survived by his wife, Judy; his sister, Sally (Lee) Williamson, two nephews, one niece, numerous cousins and several great nephews and nieces. Services were held March 6, 2018, at the Hayden Congregational Church and interment in the Hayden Cemetery. Memorial contributions can be made to the Hayden Heritage Center or Northwest Colorado Health and Hospice in care of Grant Mortuary.